The Clementine mission, also known as the Deep Space Program Science Experiment, was launched from Vandenberg Air Force Base on January 25, 1994. Clementine tested a small spacecraft, subsystems, and sensors in deep space and returned a vast amount of scientific data from the Moon. Clementine was to travel first to the Moon, map it globally over the course of two months, and then travel to the near-Earth asteroid, Geographos, for a fly-by encounter. The lunar phase of the mission was completely successful in obtaining global maps of lunar color and topography. The asteroid phase of the mission was canceled following a spacecraft malfunction on May 5, 1994. The spacecraft went into solar orbit on July 20, 1994; telemetry contact with Clementine was reestablished briefly in March 1995, but no additional scientific data were collected. Clementine began the task of building the first global digital dataset of the Moon. Improved coverage and resolution allowed more detailed geologic mapping than any previous lunar observations. While Galileo provided multispectral images of the lunar surface, Clementine offered many significant advantages: Pixel resolution is at least 10 times better than Galileo's and the high-resolution camera images offer up to 100 times better resolution, providing improved unit mapping. 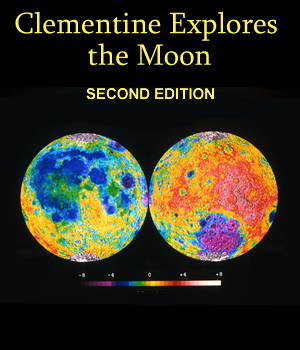 In addition, Clementine obtained global coverage of the Moon in more wavelengths than Galileo, with the ultraviolet-visible (UV-VIS) and near-infrared (NIR) cameras producing 11-color multispectral data. The Clementine program was run by the Ballistic Missile Defense Organization, United States Department of Defense. The spacecraft was built and operated by the Naval Research Laboratory (United States Navy), and the sensors were designed and built by Lawrence Livermore National Laboratory (Department of Energy). Special image processing was done by the Clementine Science Team and its associates (see slide captions for specific credits; all images not specifically credited were produced by the Clementine Science Group at the Lunar and Planetary Institute).